If you have received notice that you will be audited by a tax authority, you want an experienced attorney to help you through the process. Whether you have unfiled tax returns; alleged discrepancies in past returns, including unreported or omitted income; unsubstantiated expenses; or improper deductions, you need a lawyer who knows how audits are handled, one who has successfully protected the rights of others in tax audit matters. 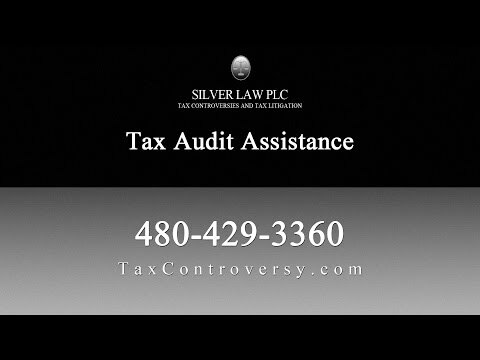 At Silver Law PLC, in Scottsdale, Arizona, our attorneys bring more than 80 years of combined tax law experience to individuals and businesses facing tax audits. Because we have been on both sides of tax audit disputes, we know how revenue agencies handle these matters. We have a comprehensive understanding of the law and procedures involved in resolving tax audit controversies. Contact our office or call us at 480-429-3360 (toll-free at 888-339-3712) to set up an appointment. We handle tax audit matters for individuals and businesses, including partnerships and corporations. In our tax audit defense practice, we handle claims involving the Internal Revenue Service as well as state and local taxing authorities. We work with clients at all stages of a tax audit, whether you have just been notified of a pending audit or you have been assessed with a tax, penalty or fine as a result of an audit. If you have received an audit letter, contact our office immediately. We will review the audit letter and request any additional information we need from the tax authority. We will also handle any requests to you for information or documents from the government. Once information has been exchanged, the tax agency will either submit a proposal of no adjustments or of proposed adjustments. If we disagree with the proposed adjustments, we will appeal of the agency’s findings on your behalf, initially at the administrative level and ultimately in court, if necessary. To schedule an appointment, contact us or call us at 480-429-3360 (toll-free at 888-339-3712). Our office is open weekdays from 9 am until 5 pm, and evenings and weekends by appointment. We are located in Kierland.